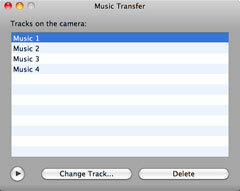 "Music Transfer" is a software for replacing the music files in the camera. BGMs for slideshows to be played back on the camera can be switched to your preferred tracks using a computer. Please click here to download Music Transfer for Mac OS X.
Click Download button to open Music Transfer installer for Mac OS X global download page. Select your language and follow next instructions on the web page.